Last Thursday I attended a presentation by Ceramic Sculpture Culture, an artists' collective which works to promote the art of emerging sculptors creating narrative and figurative work in clay. The collective's founders, Taylor Robenalt, Kevin Rhode, and Travis Winters, spoke to a full lecture hall of students, community members and faculty in the Arts Center of Towson University. Mary Cloonan, exhibitions director at the Baltimore Clayworks, moderated the discussion following the presentation of the artists' work. Robenalt, Rhode, and Winters founded Ceramic Sculpture Culture in response to the challenges they faced building their artistic careers and selling their work after graduate school. 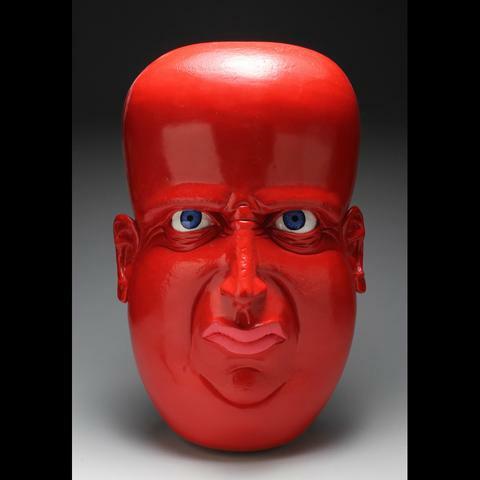 Each found the market for figurative ceramic work to be slim. For marketing purposes, "ceramic" and "sculpture" have been two separate categories, and the idea of "ceramic sculpture" is a somehow unmarketable mix of each. This points right to the "fine art" vs. "craft" distinction. How is a gallerist to approach selling a work that, in content, is "fine art," but is made with a "craft" material such as clay? To further complicate matters, many ceramic sculptors (myself included) reference traditional pottery forms in their work. How are these pieces to be categorized for sale? After discussing their predicaments at last year's National Council on Education of the Ceramic Arts (NCECA) Robenalt, Rhode and Winters decided to invite seven other ceramic sculptors to be part of a group to help promote each other's work. Using social media and their shared contacts, the collective hopes to bring about a greater awareness and appreciation of ceramic sculpture to the art world and beyond. Presentation topics also included the challenges of continuing an artistic practice after graduation, artists' residencies, and approaching galleries to show your work. Robenalt, Rhode and Winters took turns discussing their experiences and sharing advice. The Ceramic Sculpture Culture collective has big plans for the future- including a website, juried shows, and even a book. For now, check out their instagram page to see examples of their work. Also, check back here in a few days for another post I will be sharing about some insights I had after the lecture.